The motion and make up of distance galaxies provide evidence for the Big Bang theory. Before you get started, you will need a copy of the Galaxy Cards from your teacher. If you are working independently, you can print the cards yourself by downloading the pattern (PDF), or you can access the images you need from the Galaxy Shapes Google Slide deck. Human brains are great at finding patterns. From our earliest days, storytelling cultures looked for and created patterns of stars in the night sky. Today we call these star patterns constellations. As we looked through ever more powerful telescopes, we saw more detail, discovered new objects to sort, and found new patterns. Less than 150 years ago, we did not know that anything existed beyond the visual boundary of our own galaxy. The question of galaxies beyond our own Milky Way didn’t emerge until we were able to resolve objects that did not fit with our mental picture of a point of light we call a star. We will use two different sets of images of objects. The first is a collection of objects that early astronomers called nebulae. At the turn of the 20th century, a nebula referred to any fuzzy object that was obviously not a star. The second set was taken with the SDSS telescope at a time long after it was determined that these objects were not part of our own Milky Way galaxy. The images in this set are in color and have a lot of visual detail. Do your own sorting and classification of these two sets of images and compare the differences. Later we will explore how Edwin Hubble described these shapes nearly one hundred years ago. The Journal for this activity contains instructions about what to do with the Galaxy Cards. You may work by yourself, with a partner, or in a group. Begin with the set of cards that is only in black and white. These cards were taken with the 41-inch telescope at Yerkes Observatory. When you have finished with this set, you will sort the second set of cards. 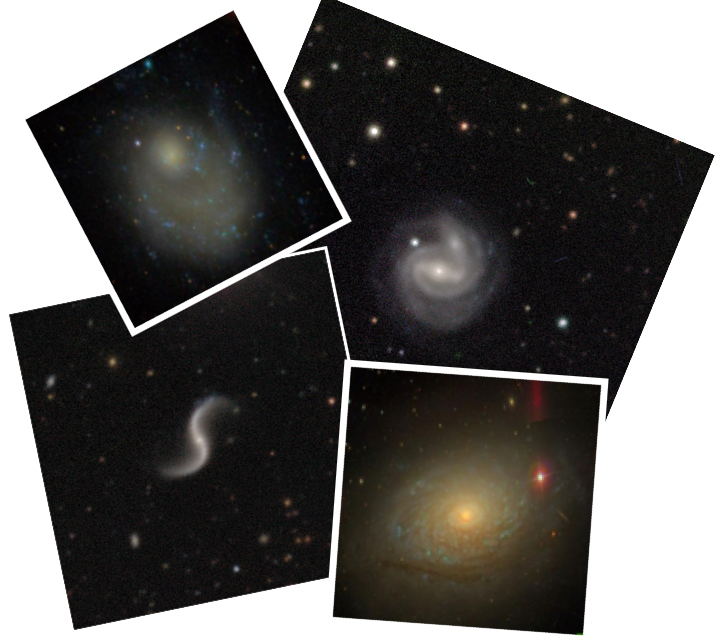 These images were taken with the SDSS telescope at Apache Point New Mexico. In 1926, Edwin Hubble developed a classification system that scientists still reference today. The tuning fork classification scheme allows us to sort galaxies on the basis of what we see in an image. Depending on how much detail a person is able to see, galaxies can be classified in different ways. This is one reason that scientists look for ways to classify objects based on characteristics they can measure. Follow the directions in the journal to see if you agree with Edwin Hubble’s classification when you use images that Hubble only dreamed would be available in the future.